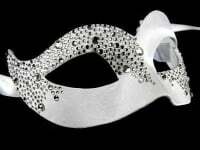 White satin fabric covered base with silver spike and clear crystal detailing...Stunning masquerade mask! This breathtaking mask is the Mystic Venetian Masquerade Mask – in white. A startling finish to a traditional style, the Mystic is perfect for teaming with your authentic masquerade ball costume. It features clear crystal and silver-coloured spike details on white satin. The Mystic is from our collection of luxury handmade masks made especially for your masquerade ball special occasion. You can adjust the mask for a comfortable fit using the satin ties and party all night long in this head-turning piece. Glamourise your masquerade costume in the Venetian way when you wear the Mystic, and forget any inhibitions. Order now and take advantage of free delivery - post and packing is free within the UK.